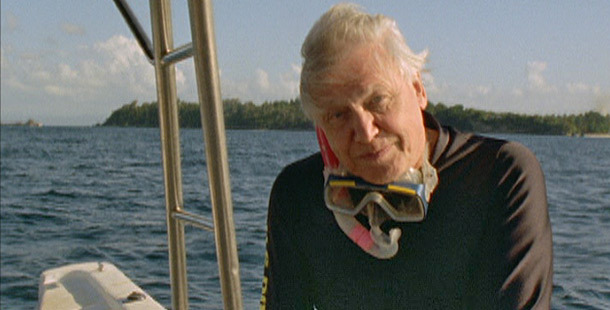 NATURE explores the shared musical heritage of humans and animals in Song of the Earth with David Attenborough. Some birds make sounds that are musical to our ears. Consider the skylark, whose melodious sounds we label as song. So it’s quite natural to wonder whether there is a connection between animal sounds and the music that humans create. The deepest mystery of all: What purpose does music serve? Famed naturalist Sir David Attenborough examines various exotic members of the animal kingdom for clues to this fascinating puzzle. After laying out for the audience the complex structures that transform sound into music — musical phrases, melodies, themes, and variations — Sir David introduces us to the animal acknowledged to produce the most complicated and longest song yet discovered — the humpback whale. With Cornell University researcher Katy Payne as his guide, he eavesdrops on these gigantic mammals through a hydrophone dropped into the Dominican Republic’s Samana Bay, where the whales congregate during the winter months. Jason Kleinman is an Internet consultant and freelance writer living in New York City. He has written extensively about the natural sciences, politics, and popular culture.